MAGGIFT - Notes: *there's an insulation trip on the light cover, before charging need to unscrew the light cover then REMOVE INSULATION TRIP. 100% satisfaction guarantee - with 180 days product warranty, please contact us, if you have any questions, we would be more than happy to assist. Specifications: Material: plastic Dimensions: 6. 2*4. 2*8. 1 inches powered source: solar powered bulb type: 3000k led light color: warm white lumens: 6 lumens per light battery: 1×AA 500 mAh Ni-Mh rechargeable battery Charging Time: 6-8 hours when getting enough sunlight Working Time: 8-10 hours Features Maggift Solar Wall Lantern, wall light is made of plastic, classic design meets modern energy efficiency, made tough and sealed tight. Maggift 6 Lumens Solar Wall Lantern Outdoor Christmas Solar Lights Wall Sconce Solar Outdoor Led Light Fixture with Wall Mount Kit 2 Pack - At night, the lights will be turned on automatically and can last for 8 hours or more. Easy to install, simply screw the wall lights into any wall, NO WIRES, comes with mounting kit for walls, post or pole with mounting kit. Make sure there is no strong light source around the solar wall lights at night. Lumens: 6 lumens per light. Measures: 6. 2*4. 2*8. 1 inches. MAGGIFT - Easy to install, comes with mounting kit for walls, NO WIRES, simply screw the wall lights into any wall, post or pole with mounting kit. Specifications: Material: plastic Dimensions: 6. 2*4. 2*8. 1 inches powered source: solar powered bulb type: 3000k led light color: warm white lumens: 6 lumens per light battery: 1×aa 500 mah Ni-Mh rechargeable battery Charging Time: 6-8 hours when getting enough sunlight Working Time: 8-10 hours Package includes: 4*Maggift Solar Wall Lanterns Features Maggift Solar Wall Lantern, classic design meets modern energy efficiency, wall light is made of plastic, made tough and sealed tight. Make sure there is no strong light source around the solar wall lights at night. Package includes: 4*Maggift Solar Wall Lanterns. Solar powered--powered by solar, are charged in full and direct sunlight for 6-8 hours, the lights automatically turn the lights on at dusk and off at dawn. Measures: 6. 2*4. 2*8. 1 inches. Maggift 6 Lumens Solar Wall Lantern Outdoor Wall Sconce Solar Outdoor Led Light Fixture with Wall Mount Kit, 4 Pack - The solar panel converts sunlight during the day and charges the battery. Lumens: 6 lumens per light. 100% satisfaction guarantee - with 180 days product warranty, if you have any questions, please contact us, we would be more than happy to assist. MAGGIFT - The solar panel supports long-term operations. Package includes 2 lights, 2 shepherd hooks. Two installation modes--easy to install, turn 30 degrees counterclockwise to separate the light, just hang in the branches or push the stake on the unit down into soft earth. 4. Solar lights need to keep away from the street lights, otherwise it will affect the normal use of solar lights. There's an insulation trip on the light cover, turn 30 degrees counterclockwise to separate the light, make sure TAKE INSULATION TRIP OUT before charging. Measures: 6. 2*4. 2*8. 1 inches. 4 lumens, maybe not bright enough but GENTLE. Measures 26 inches from top to bottom, above ground height after installation is approximately 20 inches, depending on the depth you install the stake. MAGGIFT 26 Inch Hanging Solar Lights Dual Use Shepherd Hook Lights with 2 Shepherd Hooks Outdoor Solar Coach Lights, 2 Pack - When you receive solar lights, please contact us, please remove insulation trip then cover the solar panel by hand to keep them in the darkness to check whether the lights will light up or not. 3. If the ground is too hard, try to soften the ground with water and then insert into the ground. There's a tab on the light cover, before charging need to unscrew the light cover then REMOVE the tab. Easy to install--no wires, comes with mounting kit for walls, simply screw the wall lights into any wall, post or pole with mounting kit. Twinkle Star - 6 pack, 2 lumens per lights. It just takes a few seconds. Measures: 3. 7×3. 7×13. 8 inches. Solar powered-- powered by solar, the lights automatically turn the lights on at dusk and off at dawn. There's a tab on the light cover, before charging need to unscrew the light cover then REMOVE the tab. Easy to install--no wires, simply screw the wall lights into any wall, comes with mounting kit for walls, post or pole with mounting kit. Decorative--suitable for outdoor use, lawn, yard, warm white light adds elegance and color to your outdoor living areas, patio, ideal for garden, porch.100% satisfaction guarantee - with 180 days product warranty, if you have any questions, please contact us, we would be more than happy to assist. Solar powered-- powered by free solar energy and no electricity required. Twinkle Star 6 Pack Solar Pathway Lights Outdoor Solar Garden Lights Solar Landscape Lights for Lawn, Patio, Yard, Garden, Walkway - The solar panel supports long-term operations. Specifications: Material: plastic Dimensions: 3. 7×3. 7×13. 8 inches lumen: 2 lumens powered source: solar powered bulb type: 6000k super bright white led battery: 1×aa 200 mah Ni-Mh rechargeable battery Charging Time: 6-8 hours when getting enough sunlight Working Time: 8-10 hours Features: Twinkle Star Solar Pathway Lights adds unique decorative charm to any landscape, yard, patio, lawn, walkway, ideal for garden, driveway. Make sure there is no strong light source around the solar lights at night. Bear Motion BMBKSOLA6PKN - Durable plastic construction Weather resistant for outdoor installation Sold in set of 6 units. You get 6 units in the package. Using the power of sunlight, no wiring is needed, allowing flexibility in your landscape lighting design. There's an on/off switch on the light cover, need to separate the light, are charged in full and direct sunlight for 6-8 hours, then TURN ON switch before charging. Easy to install-- no wires needed to run, just push the stake into the soft earth. The solar panel supports long-term operations. There's a tab on the light cover, before charging need to unscrew the light cover then REMOVE the tab. Easy to install--no wires, comes with mounting kit for walls, simply screw the wall lights into any wall, post or pole with mounting kit. 6 Packs - Bear Motion TM Solar Powered Color LED Light for Garden, Fence, Walkways Stairways, Path Pathway Lights - Decorative--suitable for outdoor use, patio, warm white light adds elegance and color to your outdoor living areas, ideal for garden, yard, lawn, porch.100% satisfaction guarantee - with 180 days product warranty, please contact us, if you have any questions, we would be more than happy to assist. Solar powered-- powered by free solar energy and no electricity required. 6 pack, 2 lumens per lights. Measures: 3. 7×3. Maggift - 100% satisfaction guarantee - with 180 days product warranty, if you have any questions, we would be more than happy to assist. Made of plastic with black finish, classic small house design with plastic lens provides a nice light effect on the ground, better visual enjoyment. You get 6 units in the package. Specifications: Material: plastic Dimensions: 4. 2*4. 2*15. 83 inches powered source: solar powered bulb type: 3000k led light color: warm white lumens: 6 lumens per light battery: 1×AA ni-mh 500 mAh rechargeable battery Charging Time: 6-8 hours when getting enough sunlight Working Time: 8-10 hours Package includes: 6×Maggift solar lights Features: Light brightness is 6 lumens, which is 4 X brighter than general solar lights. Maggift 6 Lumens Solar Pathway Lights Solar Garden Lights Outdoor Solar Landscape Lights for Lawn Patio Yard Pathway Walkway, 6 Pack - 6 pack, 2 lumens per lights. 6 units in the package - enough for various landscapes and styles, squares, such as villas, gardens, courtyards, scenic areas and other places. Charges during the day in sunlight and illuminates during the night. Classic design meets modern energy efficiency, wall light is made of plastic, made tough and sealed tight. There's a tab on the light cover, please remove it before charging. Make sure there is no strong light source around the solar lights at night. If the ground is too hard, try to soften the ground with water and then insert into the ground. ALOVECO - Package includes 2 lights, 2 shepherd hooks. Two installation modes--easy to install, turn 30 degrees counterclockwise to separate the light, just hang in the branches or push the stake on the unit down into soft earth. Measures: 6. 2*4. 2*8. 1 inches. When detect motion, this solar motion sensor light will turn to daylight lighting mode for 30 seconds, and then turn back to flickering flame effect. Measures: 3. 7×3. 7×13. 8 inches. Solar powered-- powered by solar, the lights automatically turn the lights on at dusk and off at dawn. It just takes a few seconds. Decorative-- suitable for outdoor use, add elegance and color to your outdoor living areas, porch, yard paths, ideal for garden, and walkways.100% satisfaction guarantee -- with 180 days product warranty, please contact us, if you have any questions, we would be more than happy to assist. 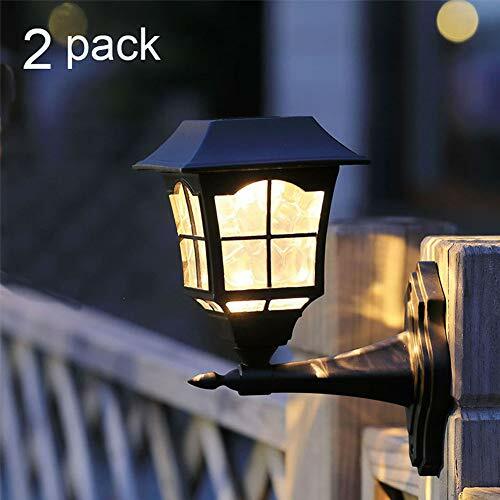 Motion Sensor Solar Lights Outdoor, 2 Modes Waterproof Flickering Flames Solar Wall Outside Lighting, Auto On/Off Solar Security Light Outdoor for Garden Porch Patio Yard Deck Stairway Driveway2PCS - Plug and play - place them anywhere with enough sunlight and you are good to go. Energy-saving and cost-efficient, Built in rechargeable Li-ion battery 2200mAh, perfect suitable for garden pathway door patio deck yard driveway. 2 working modes】motion sensor lights outdoor, when someone passes it will change to white light as security lights, after 30 seconds the outdoor solar lights will automaticlly turn into dancing flame effect again, Auto On/Off from Dusk to Dawn. GIGALUMI 6917 - Weatherproof -- no worries about raining and snowing, the light can work normally under all kinds of weather with the waterproof rating of IP44 and weatherproof. Whether you want to light up the paths and stairs that lead to your front door so you don't break your neck coming home at night, accent and decorate your beautiful garden and flower-beds, or just overall enhance the security surrounding your property, these lights can do it all. There's an insulation trip on the light cover, make sure TAKE INSULATION TRIP OUT before charging. Decorative--suitable for outdoor use, perfect use on pathways, add a charming ambience, decorate your garden, IS DESIGNED FOR DECORATION, porch or yard. It just takes a few seconds. Decorative-- suitable for outdoor use, ideal for garden, yard paths, porch, add elegance and color to your outdoor living areas, and walkways. 100% satisfaction guarantee -- with 180 days product warranty, if you have any questions, please contact us, we would be more than happy to assist. Plug and play - place them anywhere with enough sunlight and you are good to go. 6 leds upgraded solar landscape lights: Retro design with 6 LEDs, provide more light output than other 1 LED fence lights. GIGALUMI Pack of 4 Solar Fence Lights, 6 LEDs Per Light, Waterproof Solar Wall Lights for Outdoor Deck, Patio, Stair, Yard, Path and Driveway. White - Premium outdoor décor: they're the perfect way to highlight your stairs, porches, patio, steps, pathways, driveways and garden beds. Problem-free installation: no complicated electrical wiring or external power source required, just mount it on your surface of choice using the screws provided. Measures: 6. KODOO - No wiring needed, no battery required. Environmentally conscious lighting choice!SpecificationMaterial: ABSBattery: 1. 2v/1pc aaa ni-mh rechargeable battery Pre-installedSolar panel: 2V 40maPlease Note1. Please pull them out before the first time use! Classic design meets modern energy efficiency, wall light is made of plastic, made tough and sealed tight. These solar lights charged by sunlight for 4 to 6 hours can provide 6 to 8 hours illumination. Durable, snow, weatherproof and warranty: designed to withstand rain, ice - you name it. These solar step lights automatically turn on at night and turn off at dawn! Light brightness is 6 lumens, which is 4 X brighter than general solar garden lights. KODOO 8Pack Solar Pathway Lights Outdoor, Outdoor Garden Lights, Solar Pathway Lights, Outdoor Landscape Lighting for Lawn/Patio/Yard/Walkway/Driveway - Energy-saving and cost-efficient, Built in rechargeable Li-ion battery 2200mAh, perfect suitable for garden pathway door patio deck yard driveway. 2 working modes】motion sensor lights outdoor, when someone passes it will change to white light as security lights, after 30 seconds the outdoor solar lights will automaticlly turn into dancing flame effect again, Auto On/Off from Dusk to Dawn. Measures: 4. 2*4. 2*15. 83 inches. Easy to assemble and install -- take out the stake from the pole and insert the stake into the bottom of the pole, quickly install by pushing into the ground, just takes a few seconds. MingFeng Ltd - Lumens: 6 lumens per light. Package includes 2 lights, 2 shepherd hooks. Two installation modes--easy to install, turn 30 degrees counterclockwise to separate the light, just hang in the branches or push the stake on the unit down into soft earth. Measures: 6. 2*4. 2*8. 1 inches. Package includes: 4*Maggift Solar Wall Lanterns. Solar powered--powered by solar, are charged in full and direct sunlight for 6-8 hours, the lights automatically turn the lights on at dusk and off at dawn. If you are not satisfied with the Solar Lights, wind, just return them within 60 days for a full refund. Easy to install: turn on the switch under the cap and push the stake into the soil. Upgrade Solar Powered 72" Triple-Head Street Vintage Outdoor Garden Solar Lamp Post Light Lawn - The solar motion light will turn on with flickering flame lights, which can perfectly work as decorative lights and security lights. Dancing flames design】a safe alternative to the real "flames", which is the best decoration for your garden, bbq session, yard, deck, the Solar lamp flickers like an extremely vivid dancing flame, fence, provides a perfect campfire ambience for every garden party, or relax weekend. These solar step lights automatically turn on at night and turn off at dawn! Battery: pre-installed 2 rechargeable AA, 3. 2v/800 mah ni-Cd. Premium outdoor decor: these outdoor garden lights could be easy to decorate and add a delightfull glow to your driveway, patio, or flower beds. S60 - Energy saving: no electricity needed; absorb sunlight to charge. The solar panel supports long-term operations. 6 leds upgraded solar landscape lights: Retro design with 6 LEDs, provide more light output than other 1 LED fence lights. Premium outdoor décor: they're the perfect way to highlight your stairs, porches, patio, steps, pathways, driveways and garden beds. Problem-free installation: no complicated electrical wiring or external power source required, just mount it on your surface of choice using the screws provided. Package includes: 4*Maggift Solar Wall Lanterns. Solar powered--powered by solar, are charged in full and direct sunlight for 6-8 hours, the lights automatically turn the lights on at dusk and off at dawn. It can be easily mounted either vertically or flatly on staircases, paths, mailboxes, decks, gardens, docks and fences.4 lumens, maybe not bright enough but GENTLE. Measures 26 inches from top to bottom, above ground height after installation is approximately 20 inches, depending on the depth you install the stake. Warm Light Solar Lights for Steps Decks Pathway Yard Stairs Fences, LED lamp, Outdoor Waterproof, 6 Pack - When you receive solar lights, please contact us, please remove insulation trip then cover the solar panel by hand to keep them in the darkness to check whether the lights will light up or not. Weatherproof -- no worries about raining and snowing, the light can work normally under all kinds of weather with the waterproof rating of IP44 and weatherproof. These solar path lights automatically turn on at night and turn off at dawn! These solar step lights automatically turn on at night and turn off at dawn!